I couldn’t resist making another FOODball for college football season, they’re just so fun! Lucky for me my garden went on another jalapeño rampage this Summer. I had enough to pickle an entire mason jar’s worth, stock the freezer, and magically had enough over for several new jalapeño-flecked recipes. TOUCHDOWN! Since I’m about to fridge pickle a second jar of homegrown jalapeños (love this method) I was jonesin’ for some jalapeño popper action. Game day wouldn’t be the same without some totally crave-worthy cheesy appetizer faceplantage, right? RIGHT! Instead of going the traditional route (or even the untraditional route) I opted to get my jalapeño popper fix in cheeseball form. The result was a quick and easy appetizer that I’m crazy in love with. In fact I’m pretty sure this is going to make an appearance at our upcoming game night too. Board games and cheese balls FTW! 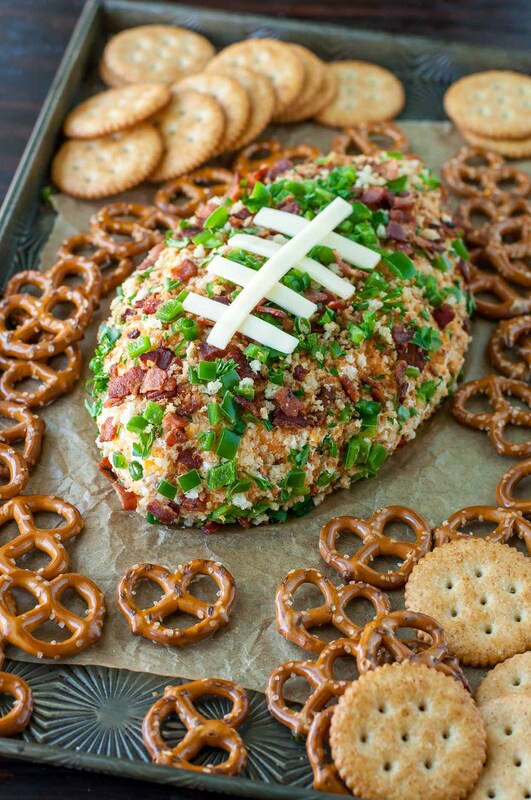 Of course we could have gone globular here, but festively shaping our cheese ball into a football is the ultimate way to appease the touchdown gods! My team was counting on me. 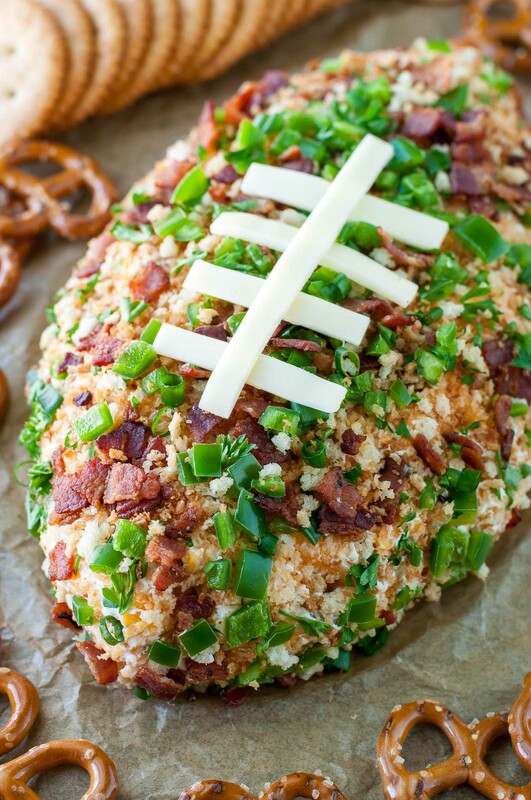 Football Cheese Ball to the rescue! Let’s do this! We’re crazy in love with this game day favorite. Want to prep your party eats the day before? Perfecto! Make the cheeseball (minus the toppings) and refrigerate until 15 minutes or so before you’re ready to serve it. Allow it to come to room temperature a bit (this will help the toppings stick) and then press your toppings into the football. Commence faceplant. AMAZING!!! Dare I say that I might love this jalapeño popper football cheese ball more than actual jalapeño poppers? Hoooooomygosh it’s good! I went the mild-medium route this time around but I’m thinking of going extra bold next time (just for kicks) and amping the spice factor up with some extra jalapeño. This is partially because I know it’s going to hurt sooooo good and partially because I love yelling “FIIIIIRE!” when eating something spicy. What’s awesome about this jalapeño flecked recipe is that you can customize it any which way you’d like! Replace the panko with this GF version or with extra herbs/jalaps to make this recipe gloriously gluten-free and/or swap the bacon to serve it up vegetarian-style. Just whatever you do, make this right meow! Your team is counting on you. 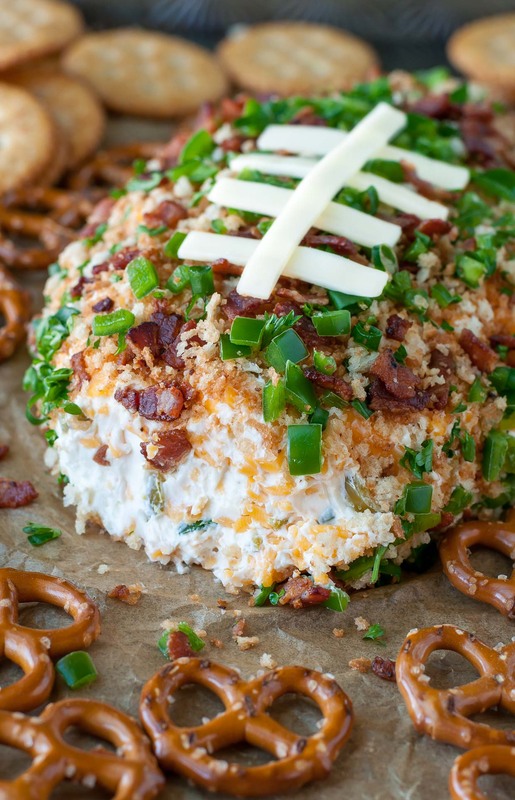 If you get a chance to try this Jalapeño Popper Football Cheese Ball, let me know! Leave some love in the comment form below or tag your photos with @peasandcrayons on Instagram so I can touchdown dance over your tasty creation. I pre made the football and tomorrow will add the final toppings… do those go into a bowl and mixed together and then put on? Or one ingredient at a time kind of thing? Hey Meghan! So stoked you’re making the football! So what I like to do is put the toppings all together in a bowl and mix them up. Then I place the football on a cutting board and grab small handfuls of the toppings and press it into the sides and top of the football, giving it a firm press in before releasing. It’s even easier doing this once it’s thawed a little so letting it sit out for 15-30 min after pulling it from the fridge can help it really stick in there. Enjoy the game tomorrow! Can you cut this recipe in half? It looks like its very large. Hi Heidi, you can absolutely halve the cheeseball recipe! How many people are you serving? Thank you for answering! Super Bowl 15-20 people. Everyone is bringing an appetizer to share. Hard to tell how large the full recipe is. What can I use instead of bacon? Extra breadcrumbs, green onion, and jalapeño works great! You could also use crushed nuts as a swap if you’d like. This has the perfect combination of cheesy and heat! 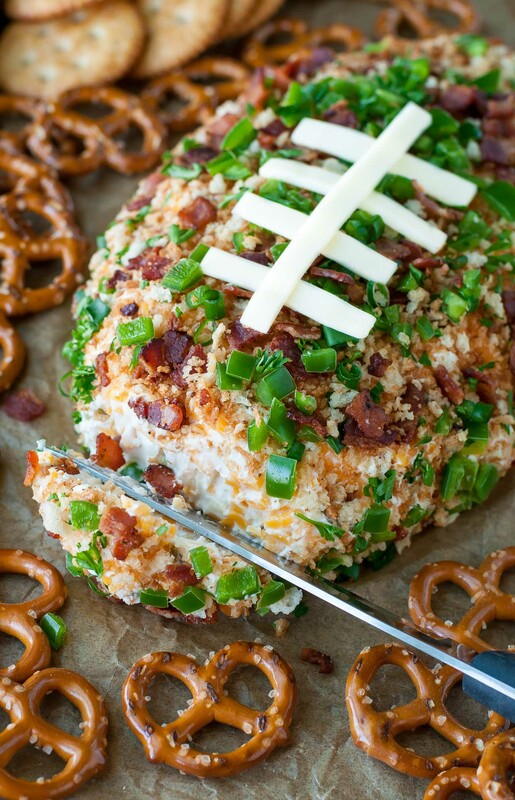 This is such an awesome recipe to have on hand now that football is back in full swing! So delicious and easy but looks stunning and fun! I just made this for a super bowl party & it was a big hit! It was so easy to make and perfect for a football gathering. Thanks a bunch! I made this for a Thanksgiving APPETIZER and it was a huge hit! I was a little sketched out about the pickled jalapenos, but it tasted great. The right amount of spice too. Everyone loved it. I will DEFINITELY make this again for our next football party. I’m kind of jealous I didn’t have this for Thanksgiving 😉 So super stoked y’all enjoyed it Katie, thank you! This recipe was amazing! I made it yesterday for a party and everyone kept commenting about how amazing it was. I was out of bread crumbs so just used more bacon! It was perfect! Looked so cool and it was a huge hit! No one wanted to eat anything else! I foolishly doubled it and had way too much left over. Made this for SuperBowl….it was a hit! Yay! Happy to hear it Allyson! Making this for a get together tomorrow. Forgot panko at the store, I have seasoned bread crumbs, will that work, or should I leave them out? 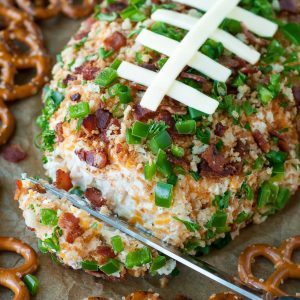 Hi there, looking forward to making this for the Super Bowl! Can you make a ahead? A little worried that the Panko might get soggy. Not sure if it’s best served cold or slightly warmed? When do you add minced jalapeños? I’m going to make this for my football mom’s get together tonight. Thanks for the great idea for a fun appetizer. Yay!!! Hope it’s a hit, Nichole! I’m already dying to make it again !:-) ? on #7 you mentioned panko bread crumbs. late in the directions you say to put panko and bread in skillet to brown. Did I miss something? I never did see bread as one of the ingredients. This looks really good and can’t wait to try it. Just made this for football Sunday everybody loved it! Delicious with a little kick. Will definitely make again. Adorable Jenn! I just saw it on FG and clicked right over! You made football cheese art…I wish I could do that! 🙂 Pinned! Thanks Carolyn! Hope y’all love it as much as we do!